The City of Fremantle is planning a range of events and services to ensure local residents have opportunities to pay their respects this Anzac Day. In a welcomed move from tradition, this year marks an important change to Fremantle War Memorial’s Dawn Service order of proceedings when the Ode of Remembrance will be recited in Noongar language for the first time ever. Last year Professor Len Collard from the Australian Research Council and The University of Western Australia’s School of Indigenous Studies translated the Ode into Noongar language. We are very honoured to have Professor Collard attend our Dawn Service at Fremantle War Memorial and read the Ode of Remembrance in Noongar language. It will be a significant occasion for Fremantle, and furthers our commitment for cultural inclusivity and respecting Aboriginal history and people. To assist people attending the Dawn Service, the City has organised designated free parking at Beach Street carparks (CP12A and CP12B) and John Curtin College of the Arts’ carpark (90 Ellen Street) until 12pm. There will be a free shuttle bus service running from Beach Street and John Curtin College of the Arts to Monument Hill between 5-6am and 6.30-7.30am. Additional parking options are available on the City’s website, with free parking available until 8am. Free public transport is available for anyone wearing military uniform or medals travelling to Fremantle’s Anzac Day services. Connecting shuttle buses to Monument Hill will depart Fremantle Station Stand 3 at 4.35am and 5.05am, and return after the Dawn Service. The Anzac Day commemorations will conclude with the traditional March through the main streets of Fremantle before returning to Esplanade Reserve for the Closing Ceremony. Road closures will be in place from 9.30 to 11.30am and affects Nairn Street, Collie Street, Bannister Street, Essex Street, Norfolk Lane, Essex Lane, Marine Terrace, Cliff Street, Mouat Street, Henry Street, High Street, Market Street, South Terrace and Pakenham Street. For more information about services, transport and wreath laying opportunities, visit the Anzac Day page on the City of Fremantle’s website. There are lots of good reasons to fix up and adapt rather than build new so I was pleased to see the latest issue of Sanctuary (a magazine dedicated to modern green homes) this issue focus on retrofitting our housing. The demolition of one small old building will negate the environmental benefits of recycling 1,344,000 aluminium cans due to the embodied energy that is lost. Despite this old fibro houses that we have plenty of around Freo often aren’t seen as worthy of retrofitting. This issue of Sanctuary makes the case as to why you should including taking as one of its many interesting case studies our humble fibro abode in White Gum Valley. It’s, as they say, available at all good newsagents and bookstores. The Fenians Festival comes to Fremantle this weekend. Following an amazing sold out concert last night with Irish music legend Sharon Shannon and Susan 0’Neill, today (Saturday 23 February) the WA Maritime Museum celebrates Fenians Festival 2019 – O’Reilly’s Escape with free activities for the whole family. Tomorrow the Moondyne Walk takes place throughout the streets of Fremantle on Sunday 24 February from 7am to 7.30pm. Is High Street in Fremantle WA’s most historically rich street? You could mount a fairly strong argument that Fremantle’s High Street is the most historically important street in WA. That is certainly the view of the port city’s mayor Brad Pettitt. “From a heritage perspective, the west end of High Street is probably the most significant street in WA, with the Round House — WA’s oldest public building — at one end and the magnificent Fremantle Town Hall — built in 1887 — at the other,” he said. “It’s a wonderfully intact street at the centre of a wonderfully intact heritage precinct. “In 2017, the entire west end of Fremantle became the largest single place to be permanently included in the State Register of Heritage Places thanks to its incredible collection of gold-rush-era buildings, which reflect the growing confidence and civic pride in WA at the turn of the century. “Interestingly, the heritage streetscape along High Street that we all love today was only made possible through the demolition of dozens of buildings dating from the original settlement of Fremantle in 1829. “In the context of the current renewal of the east end of Fremantle, it’s a reminder that Fremantle has always been a dynamic place, renewed and refreshed over time. Of course, at Fremantle’s heart is its harbour. In the early days of the settlement, shipping was served by a jetty that extended into the open sea from Bathers Beach. In 1897, government engineer C.Y. O’Connor oversaw the deepening of the harbour and removed the limestone bar and sand shoals from its entrance — thus creating a serviceable port for commercial shipping. The two moles were built to protect the harbour entrance and land was reclaimed to build quays and warehouses. The inner harbour was opened on May 4, 1897. The harbour’s basic structure and layout remain the same today. The meticulous restoration of the historic Fremantle Town Hall has taken out a national construction industry award. McCorkell Constructions, the City of Fremantle’s contractor on the $3.1 million project, won the ‘National Commercial Historical Restoration/Renovation’ award at the Master Builders Australia National Excellence in Construction awards on the weekend. The 2018 MBA National Awards Dinner was held on Saturday at the Adelaide Convention Centre. The Town Hall restoration became eligible for the national awards after winning the state award in July. The project was also recognised with a WA Heritage Award earlier this year. Everyone involved in the Town Hall project should be proud of their achievement. The Town Hall is obviously a very important building for Fremantle and one that we all cherish. The level of skill and attention detail that was required to return the Town Hall to its original splendour was quite remarkable, so for the project to be recognised as the best historical restoration in Australia is a well-deserved reward. 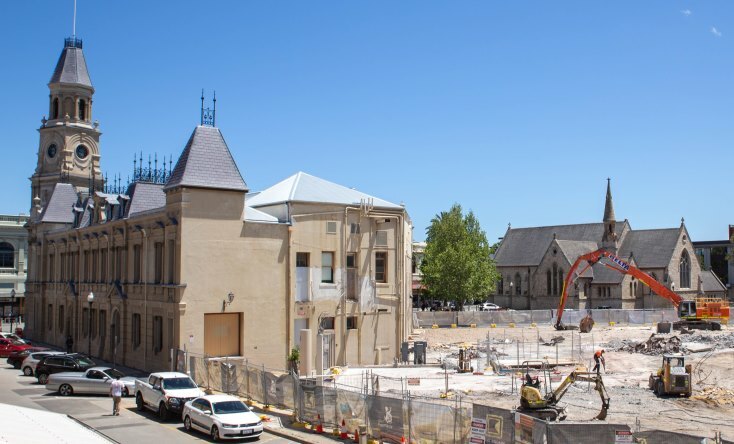 The restoration of the 130-year-old Town Hall, which was completed in May 2017, was the largest heritage conservation project ever undertaken by the City of Fremantle. It reinstated the building’s traditional appearance by stripping the paint off the walls to reveal the original stucco exterior, and also included reconstructing the slate roofs and refurbishing the historic clock. A further $250,000 has been allocated to begin restoring the interior of the building. The recent demolition of the adjoining 1960s City of Fremantle administration building has revealed the rear walls of the Town Hall for the first time in around 120 years. City Heritage Officer Gena Binet said the original limestone on the east facing wall was in much better condition than anticipated. “We could not conserve or inspect the rear walls of the Town Hall during our recent external conservation project because they were hidden by the old administration buildings,” Ms Binet said. “We were concerned they may have been damaged when the 1960s building was built or that they may have been rendered with cement, which would have caused the stone to deteriorate. “This part of the wall is like a time capsule recording how the building has changed over the years. You can see where new openings have been made and then blocked up, plus the scars of earlier structures like fire escape stairs. With the Fremantle Oval redevelopment coming into focus I thought it timely to share this gem from a 1968 South Fremantle Football Club training session. Not only will you see John Todd, Graeme Scott, Norm Cox, Kevin Miller, Gary Greer and Peter Troode kicking the ball around the Fremantle Oval but the last minute or so has some great historic footage of Fremantle viewed from the oval including the Knowle and other historic buildings.